I have no trouble with Ilyssa, Dana is seriously old news. Peter is the dirty GB it seems at this point. As for canon issues..... Seriously The Video Game isn't made to fit with the RGB so stop trying to fix what is not even close. 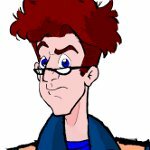 Personally I'd rather see new Extreme Ghostbusters and see the game and the possible 3rd movie never come out and I'd be happy. The Cartoons were more interesting anyways. As for GBFans.... I'll tell you what, I've only started posting there a week, and already have seen AJ and other fight over things like that list thing he's doing. I don't get the whole thing behind that place. The only reason people go there is for the content on there pages. And seriously is everyone over there Film fans with Prop packs? I'm sorry but without the RGB there would be no GB2 and to be honest the franchise would have never had got off the ground. As far as who did what, does it matter? Dans name is in the credits, and he got paid, so its Ghostbusters. Get Over It. I like the stories in the animated series and thats how I feel. Why do I have to only love the First film? Why? If it wasn't for the Cartoon I would have never gave two shots about the movie. Seriously! Rant warning taken. Therefore, I will not respond in kind. I think the thing that pisses me off about this entire community is this gargantuan rift between people who love the films, and people who love the cartoons. I think I may be the only ghosthead left who likes both. It's nice that everyone wants to stick their heads in the sand and scream "impossible!" and "there will never be peace! Get over it!" but I am content to try and find a reconciliation. I'm sorry if this offends people. Now...perhaps I'll get an answer to my question? Well I guess I jumped the gun a bit there. 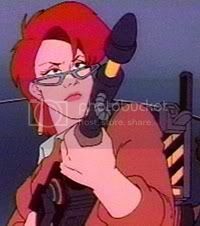 Hey I own the movies and I really do enjoy them, However I also value The Real Ghostbusters and Extreme Ghostbusters. I think they are as much canon as the Films. So it pisses me off reading all week how the RGB is a small moment and doesn't count towards the franchise. 140 episodes don't count, but a ill made part 2 is great. I'm lost in disbelief. I grew up on the cartoon series, It to me was 6 years of my life I loved. It meant something to me. That's why people like me and Fritz exist. We are here to make it work, and send the naysayers packing. "The only edict I serve is my fist. "- Garfield, "Garfield's Royal Rescue"
i like the movies and the cartoons... what little of the cartoons i've seen. i was born in 89, so of course i was too young to remember. however, one of my first, earliest memories, along with the one of me playing in a giant donut (you know those colorful donut things that look like ring toss, and in fact might BE ring toss? yes, we had a giant one of those, and my mom plopped me in it many a time), is of watching GB2 and being completely TERRIFIED of Vigo, but whenever I'd see Spengler I was automatically comforted.... seeing a theme here?! My problem is that I had just trued one when the movie came out . So I can't remember if it was the cartoon or the movie i first sell in love with . Thinking about it, remember that animation is often stigmatised in the West as being strictly for kids, which it isn't really - so that tends to work against the cartoons. What I don't understand why they are reaching for a whole new character out of the wide blue sky when they can utilize the character of JANINE...I'm not being biased here, she has a lot to offer in terms of an interesting lead, a crush on a Ghostbuster, back history with the guys, a fiesty attitude (circa Seasons 1-2) and a witty dynamic with Peter...lots to work with there people. Romance and disses abound. It just seems like they are doing every cliche in the book -- re-inventing the wheel, fixing what ain't broke, etc. Bottom line, the rationale behind this move is like having a Mercedes Benz, putting into the garage and saying "Hey, let's grab this Pinto and throw some rims on it, a spoiler, and booming sound system"...when the Benz they put in the garage already comes fully equipped with that stuff. Know what I'm sayin??! As for canon, WE, THE FANDOM, can decide whether this "counts" or not. I vote nay. Why? IT'S A GAME!!!! Yes there is a plotline, but it's a GAME!! The outcome is different with each person depending on their playing level, therefore there is nothing "concrete", it's subject to the "playing" process and individual achievement, we all know it's clearly a money-making venture and not necessarily created by those with the Ghostbusters Franchise (old school fans included) best interest at heart. So it doesn't count. As for canon, WE, THE FANDOM, can decide whether this "counts" or not. That's gotta be one of the most arrogant things I've ever heard. As a fan, it's your job to adapt or get off the fandom. Aykroyd invented Ghostbusters....he has a right to do with it as he wishes. we all know it's clearly a money-making venture and not necessarily created by those with the Ghostbusters Franchise (old school fans included) best interest at heart. So it doesn't count. Those guys took pains to make sure that Ghostbusters fans would get a full authentic ghostbusters experience. One of their prime concerns was to please ghostbusters fans. Don't presume to speak for the entire fanbase....a lot of us are voting "yea." Yeah, and I'm tired of hearing the whole "money making scheme" aspect of it, because the fact of the matter is, boys and girls, Ghostbusters hasnt had any life to it for DECADES. They could have just as easily used something else to make a quick buck off of, but they didnt. They went to the trouble of getting the original writers of the movies onboard, got all the main characters in it, and had to clear all their decisions through the minds who CREATED the universe that we love so dear (well most of us love so dear anyway). And before you try the other route next, Dan Aykroyd and Harold Ramis sure as hell didnt need the money, Harold has made a rather good life for himself directing, Danny is RETIRED with a wine vinyard and Bill Murray... God-knows he hasnt had any desire to make money off Ghostbusters for a LONG long time. At most its a way to relive the glory days of when Ghostbusters was a national sensation, and I challenge ANYONE to honestly say to me that they wouldnt do the same damn thing in their positions. Thats true. I think its simply fandom that feels threated by the Game. I think in the end, the fans will fall in love with it, because lets face it, Everyone here wants to be a ghostbuster, and this game will be as damn close as it gets to that. And like I already said, RGB and EGB really have not been on the same canon since GB II anyways. Cant we all just get along? That's a great picture, Fritz, I especially love the one you sent to me for our project, as well! Anyhoo, yeah. I'm more interested in getting along and having some hope rather than damning the thing before it even hits the shelves.